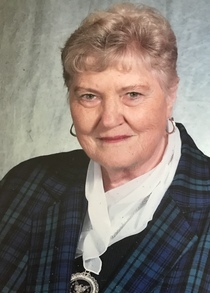 Lotus L. Wakefield-Bauer, 79, of Wheatland, Wyoming passed away Friday, June 8 2018 at Platte County Legacy Home. She was born Tuesday, May 23, 1939 in Cheyenne, Wyoming the daughter of Delbert and Marie (Tyson) Giles..
Lotus worked for Mountain Bell in Cheyenne until 1978 when she transferred to AT&T in New Jersey. Lotus continued her career in New Jersey until 1990 at which time she retired and moved to Wheatland. She was an active member of the Telephone Pioneers. Lotus and Fred enjoyed many years of retirement together, traveling in their RV with the Telephone Pioneer camping club and later snowbirding in Mesa, Arizona. Lotus is survived by her husband of 27 years, Fred Bauer of Wheatland; two sons, Don (Terri) Pindell and Tom (Andi) Pindell both of Wheatland; step son, Todd (Lynn) Bauer of New Jersey, step daughter, Lee Leeper of New Jersey; step son, Scott Bauer of Bali, Indonesia; two sisters, Louise Bishop of Casper, Wyoming and Virginia Adragna of Cheyenne; nine grandchildren and spouses, Brandon Pindell, Jason (Alison) Pindell, Shelby (James) McClung, Nathan Pindell, Dalton Pindell, Jenna Bauer, Michael Bauer, Sara Leeper, Casey Leeper; and three great grandchildren, Madison Pindell, Emily Pindell, and Owen Pindell. Memorial gifts may be made to the American Lung Association in Wyoming in care of American Lung Association, 822 John Street, Seattle, Washington 98109.